The oft-rumored and long-awaited successor to the iPhone 4S will ship on September 21st. It's almost an understatement to say that Apple's iPhone has been single-handedly responsible for popularizing mobile gaming over the past several years. And today, in a press conference in San Francisco, Apple's Phil Schiller debuted the next generation of the company's flagship product: the iPhone 5. The new phone is loaded with features that should excite consumers and tech aficionados alike. The iPhone 5 is thinner than its predecessors, and features a larger screen, higher resolution camera, and faster wireless networking. More notably for gamers, the new phone is equipped with the A6 system-on-a-chip, which Apple purports will run twice as fast as the A5 chip installed on the iPhone 4S. Smartphones are already capable of some pretty impressive graphical feats, but if the new iPhone is as powerful as Apple claims, the iPhone 5 may be setting a whole new bar for graphical performance. 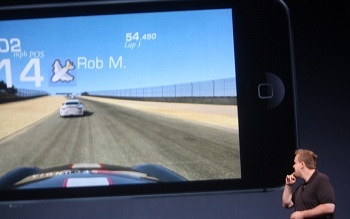 Some developers have already gotten their hands on the new tech, and EA's Rob Murray made an appearance during the conference to demo Real Racing 3. Interestingly, the demo featured a multiplayer race - but not a simultaneous one. "Time-shifted multiplayer" is what EA calls it, and it was asynchronous. "I can challenge Vince one day," Murray explained, "And he can race me the next." While this sounds a lot like racing a friend's ghost - a feature we've had for decades - Murray was actually able to interact with his not-quite-there opponent, knocking the other car around. The iPhone 5 will be available for pre-orders on Friday the 14th, and pricing will be tiered by flash memory size: $199 for the 16GB model, $299 for 32GB, and $399 for 64GB. It ships on September 21st for the US, Canada, Germany, Britain, France, Japan, Hong Kong, and Singapore.